No teacher needs another apple refrigerator magnet or figurine. If you try to “live green,” you certainly don’t want to give another little throw-away knick-knack that will wind up in a landfill. Here are 5 knock-their-socks-off green DIY teacher gifts that the teacher will actually love. Every teacher is pleased to see a gift that’s useful in the classroom. Put a bouquet of flowers – from your own garden, if you have them – in a mason jar or other glass container, and fill it part way with water. 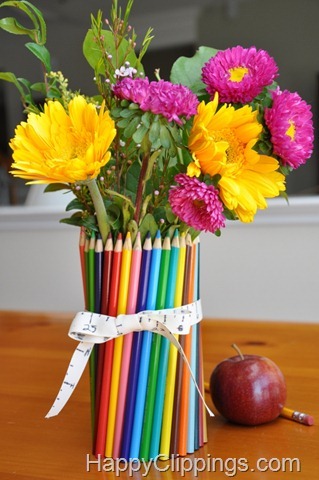 Surround it with colored pencils and tie the whole with a bow to secure them. Don’t want to give flowers that will wilt in a few days? Use recycled fabric to create these gorgeous fabric flowers from Crafting a Green World for a gift that will never fade. Have a little more time? Re-invent something teachers of small children see every day, and make a teacher smile. 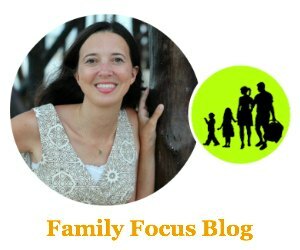 Alexis Anne over at cleansmartsimplestyle.com has a great crayon art tutorial for grown-ups. 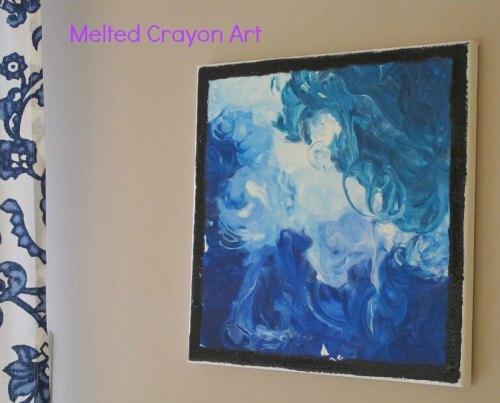 Melt crayons with a hair dryer on an artist’s canvas to create a one-of-a kind work of art worthy of a place on an adult’s wall. Upcycle your child’s old, broken or already-melted crayons for a “green” flair. Here is a fun tutorial for melted crayon art. Still want more ideas for eco diy teacher gifts? Pink and Green Mama blogged these great little berry box gifts. She used recycled berry boxes with fruit-themed soaps and lotions and a little home-printed card that says “I couldn’t have picked a better teacher.” Use organic soaps and lotions to bump it up a green notch. You can find your own locally to keep the gift’s carbon footprint smaller. This sweet, personalized gift radiates “green.” Paint a terra cotta flower pot with chalkboard paint and include a packet of organic or heirloom seeds. Make your own seed packs with scrapbooking paper, snap up packets at a local seed swap, or buy them at the store. 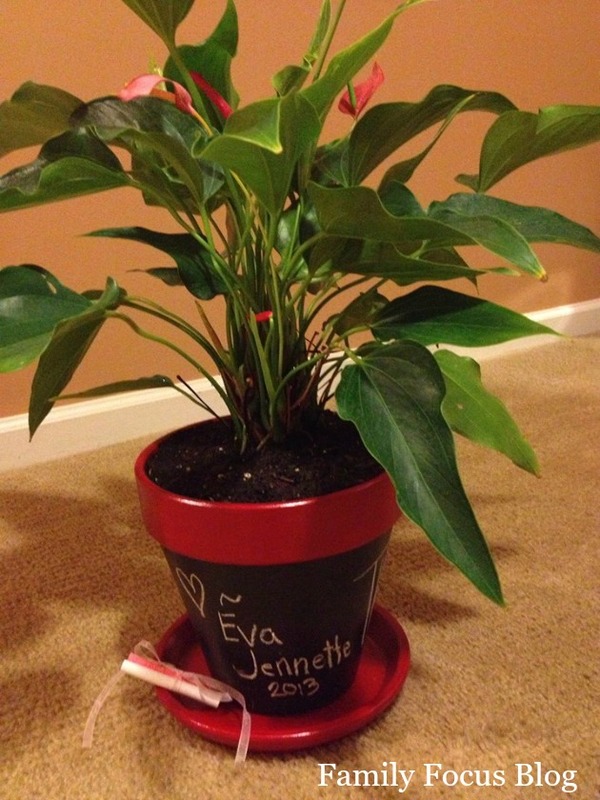 Write the teacher’s name or sign your child’s in chalk and include the chalk with the gift, so the teacher can label the contents of the pot every time he plants. For extra brownie points, use a no-VOC, organic chalkboard paint like this one. Upcycle an old flower pot, galvanized tub or basket into a classic gift that a teacher will treasure. This one takes a little planning, but it’s worth it! It’s Written On the Wall posted this gem last year. Use construction paper (or for extra points, recycled paper – an old Highlights kids’ magazine, maybe?) to cut out flower shapes. In the middle of each flower, glue a picture of one of the teacher’s students. 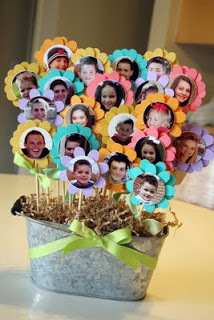 Recreate the whole class for a commemorative “flower garden,” then attach the flowers to wooden sticks. Anchor them in the tub with crumpled newspaper or a piece of floral foam and cover the inside of the tub with fabric scraps or leftover “grass” from Easter baskets. Voila! A personalized keepsake the teacher will treasure. Here is the last of my ideas for green diy teacher gifts! 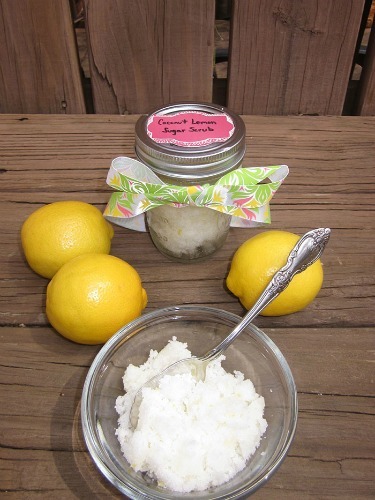 This DIY sugar scrub is easy to make and your child’s teacher is sure to enjoy this all natural way to exfoliate in moisturize in preparation for the summer! When the time comes to pick out a thank-you gift for the ones who have taught, watched over and guided your little loved ones all year, it can be tough to decide what to give. Whether you’re super crafty or just super time-crunched, there’s plenty of great green DIY teacher gifts on this list to make your child’s favorite teacher smile. Do you have any additional ideas for green DIY teacher gifts that you have given or received? What awesome ideas! As a former teacher, I would have loved to have received the chalk flower post and the melted crayon art. These are really cute ideas! I’ve done the melted crayon art before,. I really liked the colored pencils flower bouquet!